Movie free listed from 4 October 2018. 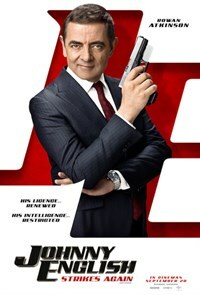 JOHNNY ENGLISH STRIKES AGAIN is the third installment of the Johnny English comedy series, with Rowan Atkinson returning as the much loved accidental secret agent. The new adventure begins when a cyber-attack reveals the identity of all active undercover agents in Britain, leaving Johnny English as the secret service’s last hope. Called out of retirement, English dives head first into action with the mission to find the mastermind hacker. As a man with few skills and analogue methods, Johnny English must overcome the challenges of modern technology to make this mission a success.